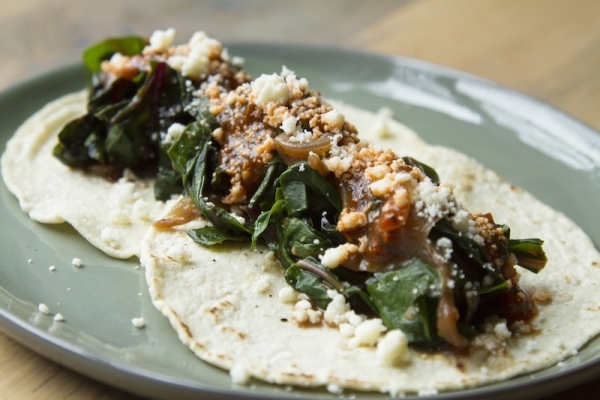 I can think of about a million more words for these tacos with Swiss chard and caramelized onions inspired by something I ate at the huge Friday market years ago in Toluca. There, they’ll serve you wholesome tacos de quelites (a green we call lamb’s quarters in the States) from street stalls. If a trip to Toluca isn’t in the cards —or you’re like us here in Chicago, merely hinting at Farmers Market season and can’t find lamb’s quarters yet— these tacos can be made with any green, really. Think Swiss chard, spinach, kale, mustard or collard greens. If you’re looking to keep this dish completely vegetarian (or vegan, if you omit the optional queso fresco), opt for a splash vegetable stock with the greens. Chicken stock will lend more richness, though. Cut the chard crosswise in ½-inch slices (small spinach, lamb’s quarters and amaranth leaves can be left whole). In a very large (12-inch) skillet, heat the oil (or its stand-in) over medium-high. Add the onion and cook, stirring frequently, until browned but still crunchy, about 4 to 5 minutes. Add the garlic and chile flakes, stir for a few seconds until aromatic, then add the broth or water, ½ teaspoon salt and the greens. Reduce the heat to medium-low, cover the pan (if you don’t have a lid, a cookie sheet works well) and cook until the greens are almost tender, anywhere from 2 minutes for tender spinach and amaranth greens to 7 or 8 minutes for thick collard greens—Swiss chard needs about 5 minutes. Uncover the pan, raise the temperature to medium-high and cook, stirring continually, until the mixture is nearly dry. Taste and season with additional salt if you think necessary. Serve with warm tortillas, salsa and crumbled cheese for making soft tacos. i am a huge fan. i am currently working on introducing tempah into my diet i would appreciate some help and recommendations on how to use this ingredient.